Thanks to everyone involved in this Modified Peterbilt 389’s development. Good work! Likes: many engine options including a monster Cat with excellent sounds, an 18-speed transmission with a retarder, short-arm side mirrors so you can always see the driver’s side mirror without head turning, a variety of fender options for the rear wheels, and cool paint options. Issues: front bumper corner markers can be seen in external views and from the passengers seat but not from the driver’s seat (with or without fender mirrors), paint options mash the game’s font (fixed by rebooting the game), some paint jobs don’t “stick” and change to something other than the chosen options, the apple on the dash is still in the background wallpaper model displayed behind the options screen (no big deal), and the “O” key not only toggles the beacon on and off it changes the dashboard GPS display from its options display to live GPS display (don’t know where to change that option). The truck is stable on my system and I’ve driven it over a thousand Ks without issues. This excellent mod now gives me four stable American trucks. Thanks again, guys. Just download then use Winrar to extract it! Thanks to everyone involved in this mod’s development. Good work! Thanks for sharing the great review. – Although the apple has been removed from the dash in most views, it is still there in a few. It’s in the passenger seat view (the apple does not roll around however) and the apple is in the wallpaper preview when you are in the game’s root-options menu. – the low-rider fenders have an issue with the surface coating. Paint colors change depending on angle of light (in the mirrors they always look white). Even chrome becomes a painted surface and then switches back to chrome as you drive along. – optioning the radiator grill Peterbilt emblem causes an immediate game crash. Thanks again guys! I’ll leave it at that for now because I can’t wait another minute to get back into that truck and go for a drive. That monster Cat engine is such a hill leveller! Thank you so much dude. I will set this comment as feature! Totally agree with you and i meet same problems…….hope will be fixed. Long time to see you dude! And the video is perfect as always! Have you seen all those screenshots? Are you using other truck mods? This is so weird. I am using TSM too and this truck works fine with me. Can you give me the log file please? Okay I see. Very nice! Everything is okay in the mod, sometimes appears flashes into the cab, but the really important is maybe is repair the ubication of fifh wheel because over 40 ton the truck loose sterring thank u. One solution if the creator of mod is take the base k 800 t thank u people. Just delivered a 35-ton crane with this truck. The trailer’s end got stuck on a Chunnel train car and had to call for assistance to set us free. The rest of the trip was great. Any ideas on the particular tweaks with this version 1.1.1? I’ve installed it but don’t immediately see any obvious differences. I can’t back up under any trailer that is assigned to me for a load. I can back up under any other trailer. Can you dump the axle? Or what can I change? I had a similar experience picking up a trailer at one of the mine sites. The area’s rough terrain had the truck and trailer at odds for connecting. In my case, I kept tweaking my approach to the trailer until I was able to get under it and connect. Your “milage” may vary, as they say. Cheers. Love everything apart from the sounds, prefer the turbo & stacks noise from the Peterbilt 379EXHD_Stas556 mod ? Trying my first hack, adding those sounds to this excellent mod for a quick test, I found the sounds supplied with this go weird after 2000rpm, like an extra horrible whistle noise. I have run this unit for nearly 5000km now, really excellent job on it, very enjoyable to cruise around with, thanks for the efforts of the creator, nice addition to my game. Thanks for your review mate! I can’t get jobs with this truck, why? What did it say dude? This update to v.1.2.1 is excellent. I can say that all three points are true in my experience. The 8×4 chassis powers the last 2 axles, now I can see the bumper sticks from inside the cab (Thanks! ), and there are some added wheels although I didn’t chose them. This truck is my current fav with nearly 200K on the gauge. Thanks again to those who tweaked this version! yep. I love this truck! are there still the 10×4 and 10×6 chassis in this mod? is there a way to change the truck that this replaces ? I think it replaces nothing in game. i mean, is there a way to change the ingame dealer and trucks that this is placed in ? Yep sure but I am not a modder so I don’t know how lol. So sorry! Good work on this mod! Version 1.4 continues to refine a fantastic truck. Thank you, big time, to everyone involved. New engine sounds. YES!!! This is a great improvement. Better in every way. Still see white tips on the bumper marker when inside the cab. I’m delighted to say that the lowered chassis option addresses the issue where the truck cannot get under trailers at Ikea when using Jazzycat’s trailer/cargo pack 3.4.1. The engine, transmission, and brake sounds are fantastic! Best version so far. Thank you very much Leigh. Forgot to add that information! Hope the developers of this brilliant latest version 1.4 check these comments, Will. The lowered chassis option lets the truck take trailers from Ikea when using Jazzycats trailer/cargo pack 3.4.1. Thank you! The lowered chassis changes the headlight to a single-bulb round version. Issue: There are no front signal lights in this chassis configuration nor an option to install one. Let me say how fantastic the sounds are in this version. Wow! They tweaked the volume level of the turbo to perfection, the air brake sounds are spot on, and the transmission air shifter is like real. Can you see it in the About > Trucks menu? What is your game version buddy? Another excellent tweak to this brilliant truck. Thank you developers. Grill options are a nice surprise, So happy for headlight options because we were missing signal lights in v.1.4 in the lowered chassis option. I get some weirdness with the fender options like white tires or oddly coloured/patterned fenders that should be chrome or painted. The half fender in chrome works perfectly for me :). There are rear light package options too including one with mud flaps. Paint packages can cause some interesting results including a transparent skin. I’ve been able to tweak one of the custom paint options into a beautiful (IMHO) truck. If I were to buy one for real, this is the truck I’d buy. Let me say again that the sound package for this truck is fantastic. The sound of the engine, the sound level and quality of the turbo, the transmission air shifter (18 speed with retarder), the air brake system, and—most of all—the engine brake (Jake brake) audio are all brilliant. Spot on. With headphones I’m in that truck and doesn’t she sound amazing? Yes. Thank you for the stunning review, as always! It is my pleasure buddy! why cant i go over 90 mph? Check the Settings in game buddy! Version 1.6 is out. It includes a major improvement to the fenders option and other refinements. Ya I have updated it, just forgot to change the title lol. – ATTENTION NOW ALL OLD SKINS DON’T WORK ANYMORE ! Awesome truck! Almost perfect handling even at 150 km/h. Only problem so far: my FPS is getting halved when I drive, but overall: highly recommended. 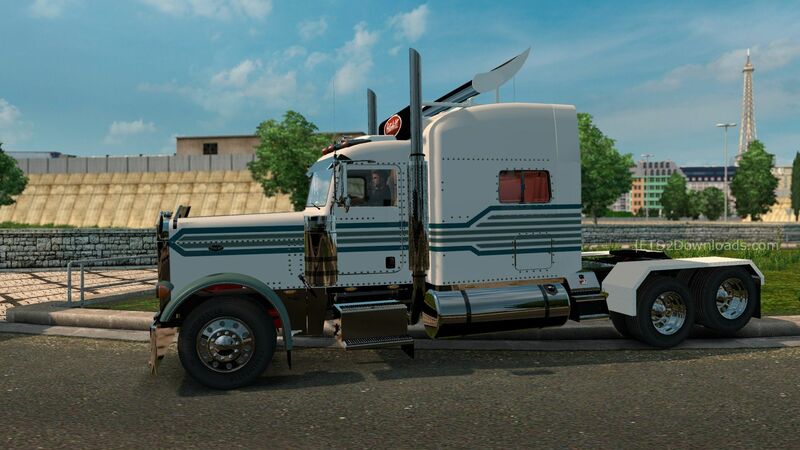 Hi Will i test the new peterbilt nice nice mod, but when i choose for a daily cab i turn back and see the old cab i hope next edition of the mod fix that thank u for upload mods for us. Version 1.7 further polishes what is for me the best ETS 2 truck available. I’ve got nearly 100k on the odometer. The best improvement contained in this version is in the paint shop. All the options now work without causing an issue to the game software. On my wish list is a roof-top bar for additional horns and lights. Time to jump back into the cab and take her for a spin! Big thank you to the developer for your time and energy. Thanks Will. Thank you again Leigh! Always love reading your comments! v1.8 and she keeps getting better! As suggested, I sold the old truck (v1.7) to avoid issues. Sorry to see it go. I drove over 200KM in that truck. This version provides all the features the author lists. I really appreciate the roof options for additional horns and lights. Well done!!! 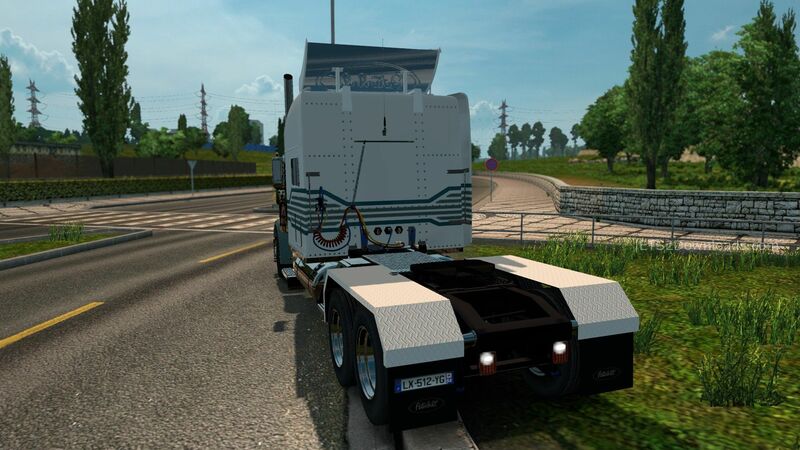 This is the first version of this truck where the roof light works without crashing ETS 2. Many light options around it too. 🙂 Some of the marker lights are new and well done. Thanks so much to the developer for his time and interest in this mod. Thanks for the great new report buddy! In case the developer reads comments like these—thank you! I appreciate the complexities involved in making tweaks to the mod. You’ve done a splendid job of advancing the development of this vehicle. Being able to put accessories on the roof of the cab allows for the addition of a pair of much-needed bigger horns. Plus, more lights are always cool. Disconnect the keyboard shortcut for roof flashers (the “O” key) from the in-dash GPS. If you have roof flashers they have to be turned on in order to use the in-dash GPS. Could the in-dash GPS be defaulted to “on”? The tips of the front bumper marker pole tip lights are red when viewed from outside the cab. That is correct. However, inside the cab they are white. Thank you for your time and energy on this truck! Great review as always buddy! Where do I get the skin? You mean the included skins in this mod? i send u links u check that ? Will in that site i found u too? wonderful site like downloads keep going man. I got them, gonna try as soon as possible. Thank you very much! Ok Will when u can re upload rus map in mega, and when you could check the mods the k100 is just alittle but is the same of 58 i don`t found diferences but your expert eye could thank u Wil we are in touch keep going man. Hi, the new download link for the Rus Map will be available tomorrow due to my bad connection today. I tested your K100 mod yesterday but can’t find much change with the previous version. Thank you buddy! does this mod work with older versions of the game? Another excellent upgrade to this truck. Viper is the current developer and he’s made huge improvements to this truck since he took on the modding challenge a few versions ago. Not noted in the version info above but Viper mentions it on the SCS message board, sell your current PB 386 and purchase the truck new to avoid software issues. I didn’t sell first and experienced strange behaviour with the mod. Taking a step back to sell the old one fixed that. The in-dash GPS is on all the time now! It used to be linked to the roof beacons. The tri axle has fenders. That is a deal maker for me so I’m running three rear axles now. There are cool new LED lights for markers, signal, backup, and brake. New accessory bar on the fuel tanks. I put a couple of signal lights there. Cool light bar for the back end. Thank you once again man! It doesn’t show up in the daf dealer. It works fine with me. Please try to visit another dealer buddy! What does the clean look do? No wonder I can’t find it. Thanks. Thanks for the new video buddy! will it work with low end pc? It won’t hurt your FPS. Don’t worry buddy! There is a serious problem with this truck that makes it virtually unusable anytime other than broad daylight. When headlights are on there is a constant, highly annoying yellow flickering in the interior. This is caused by the various truck lights (including decorative) reflecting off exterior objects and can only be fixed by the author. Verified that other mods are not causing the issue by loading the truck in a new profile. For now I simply can’t drive with a disco in the back of my cab. Shame really, because this was looking to be one of the most perfect trucks I’ve ever seen in ETS2. ps. Also, is it possible to remove or make optional the “fire extinguisher” and DOT text on the sides? Wouldn’t be so bad if it wasn’t embossed and in an ugly font. Thanks for the honest review buddy! Hi Will, thanks for the comeback. I’ve reverted to an older version of the 389 (Modified 5.0) not sure if it’s authored by you too it has a similar problem but to a much lesser degree – only the left flasher does the disco thing. Do you plan to release another update? If so, once the lights issue and black text are fixed it’ll be an impeccable masterpiece. Since the beacons can be turned on and off separately from the other lights, I ask if you drive with the beacons flashing all the time? At times I like the effect. It gives a greater awareness that the beacons are on but in the end it would be better not to see the effect as you suggest. The positioning of the beacons on the roof changes the in-cab effect. Perhaps rearranging your beacons will lessen the effect? I seldom drive with beacons, this issue occurs even without beacons installed. The flashes in cab are random, not repetitive like beacons. Flashing occurs at all speeds but is more severe at higher speeds. If you like I can also try to make a video showing this. Encountered a similar issue in the past caused by a trailer mod, but this isn’t the case here sadly (new profile no other mods). Probably not an easy fix and one best done by the model’s original creator but oh well. As for the text, perhaps an option to have it or not would be ideal. Thanks for the comeback. 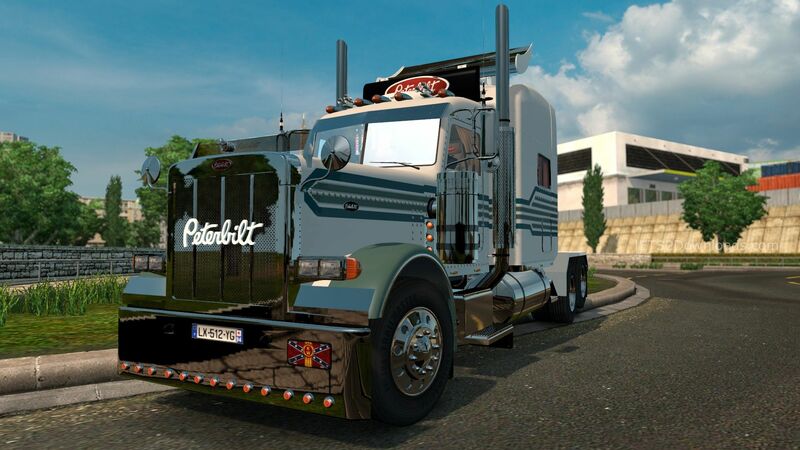 within the download files i found this “Peterbilt 389 Modified v1.9 Clean Look.scs” what is this file ? The Clean-Look mod will paint the rivets in the truck’s body (they are chrome otherwise) and it removes the PB logo from the sides of the engine hood for a clean look. I tend not to do reviews as I feel that I have only been on here for 5 minutes, but here go. Very nice. A very nicely detailed realistic looking truck to add to your fleet, complete with a large and comprehensive ability to customise this truck into anything you want. From a giant chrome monster of a vehicle to a small little workhorse you can create anything so see fit to do. Nice interior too, loads of realistic looking details and switches inside, nice working dashboard too. all the textures are well made too. – Looks very real, both inside and outside. – Optional Rear power axle (by power i mean not turning, driven axle) WORKS, so far i haven’t found any problems with pulling a trailer with the optional rear axle turned on and engaged with the floor (not in taglift/raised position). the problem i have found with older versions of this mod is that the front wheels get raised off the ground causing no steering. So far so good and all works fine. – Lack of steering (i accept that i have never driven one of these trucks but i feel that the steer is just a little so, especially when you are trying to turn around a 90 degree or more angle you have to almost stop completely to allow your steering time to catch up, feels like i could do with speeding up a little. This may just be me being picky. Thanks for the thoughtful and well presented review. I agree with all your points. As to the “interior disco” (well put) I notice that the effect varies depending on the location of the flashing yellow beacons on the roof and by the type of trailer. At times I like the effect. It gives a greater awareness that you’re beacons are on but in the end it would be better not to see the effect. This version of the PB is much better at dealing with the loss-of-steering issue caused by heavy trailers. I think the heaviest I’ve pulled was 75 tons without much issue. The harder the pull and the sharper the steering the greater the effect. The effect is also increased if you use a third rear axle option. Raising the third axle restores steering with loads greater than 30 tons. I’m ready to be corrected but I think the steering issue is in ETS 2 and not in the mod. All trucks have the problem. The fix would be the ability to move the fifth wheel forward on the chassis and that would have to come from SCS in ETS 2. Maybe American Truck Sim will have the option. I offer my experiences with and thoughts about mods like you. I appreciate constructive reviews. Wish I could create mods but the required software isn’t available for Mac. In a way, I’m glad for that. Modding has a steep learning curve. Well, it would for me anyway, 🙂 So I’m free from diving into all of that. Love your detailed review buddy. Really appreciate it! Sure, works fine with 1.22 mate! Please remove this post. You have not requested permission to upload to this page and did not give proper credits. This truck is by amtmodding. Hey, Josh. I hope that Will gets the permissions sorted out on this mod. Till he does, where should we go on the Web to DL and make comments for the developers on this mod? I believe that the AMT modding group created this mod in agreement with the mod’s current developer Viper2 who has since released a version he has named v1.10 Beta. Viper2 says that he might not be available to continue development of the mod and says that AMT’s v2.0 is the future of the mod. So the permissions to post this mod should come from AMT and I think that Will provides a link to the site that offers it for download. Is it the download site that is violation of permissions, Josh? Are you a member of the AMT modding group? Just asking. I experience that issue with many mods, Jon. It doesn’t affect the game other than messing with the font. I fix it by going to the mod manager and then leaving the mod manager. Then the font is working again. Thanks for the quick feedback Jon! Seems like lots of players have this problem. Hope the author will fix this as soon as possible! What dealership do you pick it up.